There are certainly more famous Gaudí works in the city of Barcelona, but on our Sandeman's New Barcelona walking tour, our guide Rueben pointed out the first two Gaudi works ever to grace the streets of Spain—a pair of twin lamp posts in Plaça Reial. I neglected to photograph them (they were nothing special), but if you really want to see them, the Google Image Search has you covered. Gaudí was a little bit of an obsessive fellow. He didn't have any family and he didn't have many friends, so he devoted most of his time to the church. 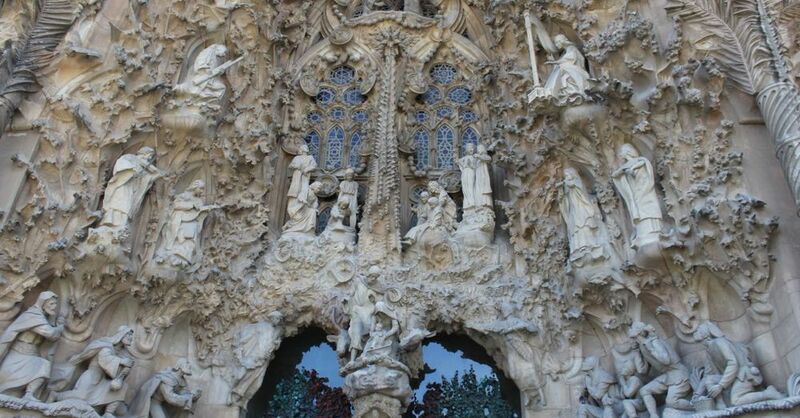 And by "the church," I really mean one church—the Sagrada Familia. 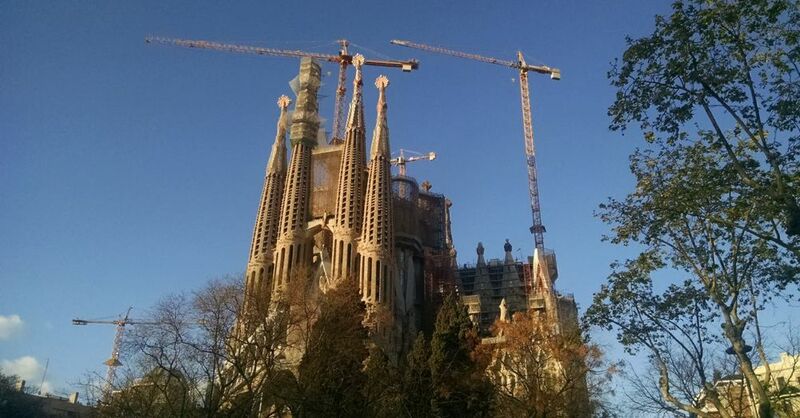 Sagrada Familia, perpetually under construction. 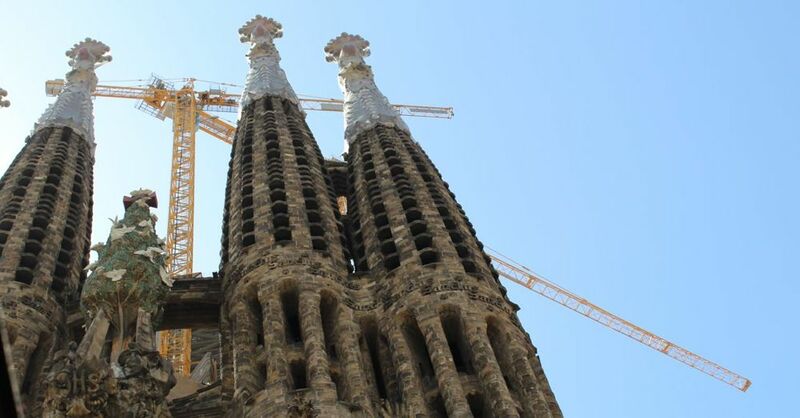 The project didn't start under Gaudí, but he took over in 1883, only a year after its construction began. When he died 43 years later, the place was only about a quarter finished. Work still continues on it today, 133 years after it was first started. Even the sun is eclipsed by the opulence of the Sagrada Familia. Our apartment was a five-minute walk from the Sagrada Familia, so we saw it every day we were in Barcelona. And every time we went by, usually to enter the Metro via the nearby station, it always demanded attention—and not just ours. There wasn't a time we went by that there wasn't a throng of tourists and photographers hunting for the best angle for the best shot. After walking by it for a few days, it was finally time for us to visit the place. We had bought our tickets in advance. Admission is €19.50 for humans over 10, and that includes a ride up one of the towers. Without the towers, admission is €15. Sagrada Familia: Glory Façade. Notice the tree. The cathedral has two sides, the Passion Façade and the Glory Facaçde. We entered from the Glory Façade, marked, among other things, by a giant tree that rests between the four spires. Above the front doors of the Glory Façade. As mind-boggling as the place is from a distance, it's even more so up close. 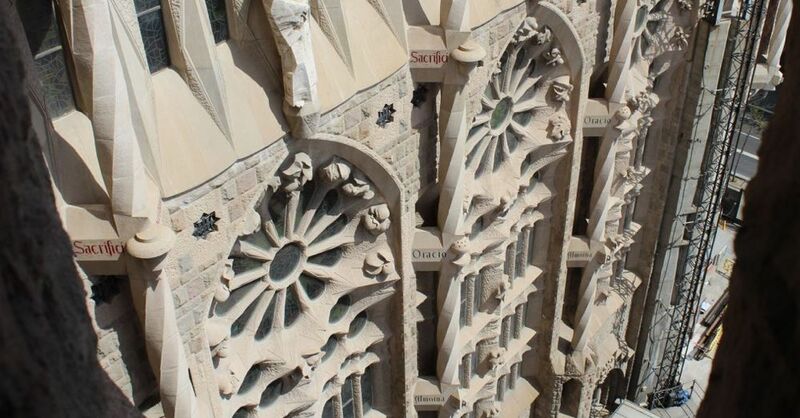 The attention to detail of Gaudí's designs is incredible. 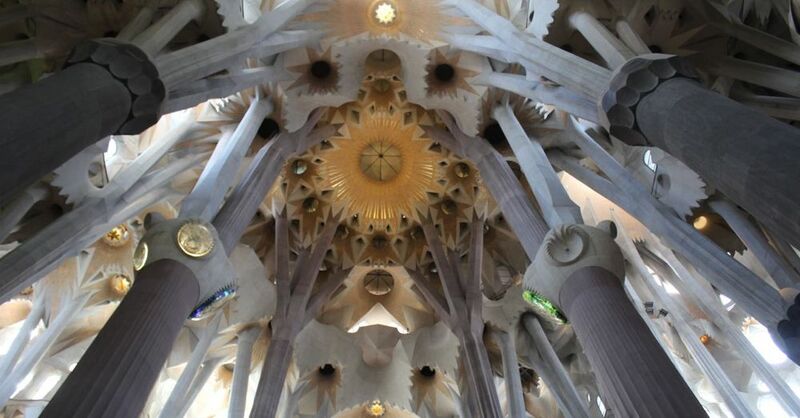 One of Gaudí's influences is given as "nature," and this is evident in nearly every aspect of the Sagrada Familia—sometimes more obviously than others. One of the most blatant examples of this can be found on the doors leading into the nave—they are intricately detailed with faux ivy leaves and various creatures from the animal kingdom. Door into the Sagrada Familia. Seeing the inside of the Sagrada Familia for the first time is astounding. It was unlike any other cathedral or basilica we'd toured up until then (and there have been quite a few). The pillars leading up to the roof are also inspired by nature and are meant to give the impression of the lofty branches of a sturdy tree. Arches of the Sagrada Familia. Even the crucifix hanging over the altar is one of the more severe and unusual we'd seen in our tours of Spanish churches. Crucifix in the Sagrada Familia. Because we entered from the Glory side, we chose to ride up the Passion tower. You can't take any backpacks up with you (the elevator—like most elevators in Europe—is pretty small and cramped), so you have to store those in lockers nearby, and that costs €1. The ride up is no big deal, and once on top, it's sort of hard to really see anything with an unobstructed because the viewing ports in the towers are so narrow. The more we take trips to tall buildings on this trip, the more we're disappointed by the experience, and I'm not sure this one was worth the extra €4.50. Close up of giant fruit on the Sagrada Familia. But the tower did give us the opportunity to see some of the construction and crazy design of the cathedral's exterior up close. Well, sort of close. As we looked out, we realized that the entire exterior of the building is covered with words and phrases. Coming down was a bit of an adventure. My mom couldn't go down the narrow steps, and the elevator operator said she couldn't ride down the elevator. I'm not sure why; it had to go down to pick up more people anyway (and we'd seen people rid down before it had taken us up, but whatever). Eventually they relented, though, and she rode down quickly while the gals and I took the narrow spiral all the way down. Down we go, round and round. 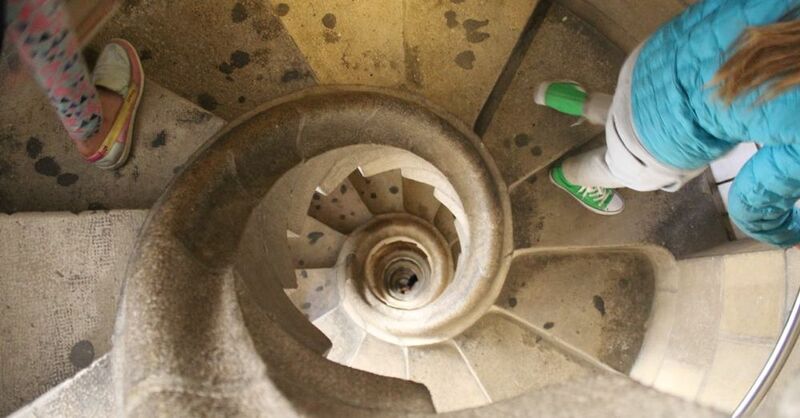 Allegedly, Gaudí took the influence for these spiral steps from watching how maple seeds (samaras or, as we called them as kids, "helicopters") fell to the ground. I'm not sure about that, but it sure was fun—and a little dizzying—to come down from the top of the tower. Once we came down from the tower, we watched a short film titled God's Architect that plays every 20 minutes or so and details Gaudí's struggles and triumphs involved in designing and building the Sagrada Familia. Then we took one more pass through the nave before we left to take a short stroll through the less surreal Plaça de Gaudí across the street. Park Güell is named after Count Eusebi Güell, the man who hired Gaudí to design the buildings and other architectural features of the park. Park Güell, which was completed in 1914, is a public park at the top of a hill. As such, we had a good walk from the Metro station, mostly uphill and it took us longer and was more arduous than we thought. 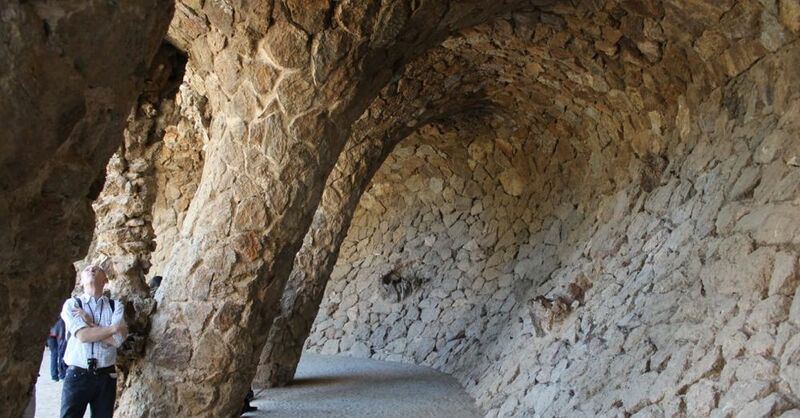 Going to the park is free, but if you want to walk among the building that Gaudí designed (known as the Monumental Zone), it'll cost you €7 per person (€5 for kids under 13). 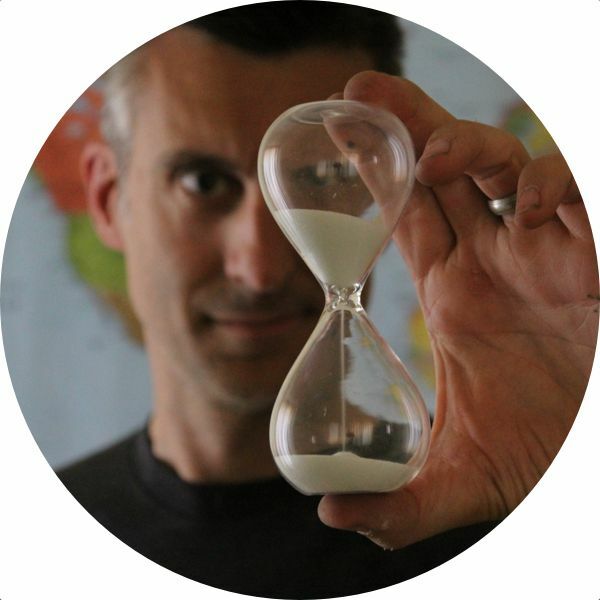 You'll have to pick a time to arrive, and don't get there late or they might not let you in. We screwed this part up, and we entered from the wrong side due to our poor Metro stop choice. After a little convincing (our forlorn look probably helped), a woman let us in the back way. She did take the time to admonish us that it was highly irregular and let us know that the ticket times are assigned because the park is designed as a tour. But the Monumental Zone is not really a tour at all. Sure, they give you a pamphlet that has numbers on each building, but once you're through the gate you can go anywhere you want in any order you want. The design of the place was supposedly inspired by the Temple of Apollo at Delphi and, like the Sagrada Familia, incorporates elements of nature into its architecture. In fact, one of the largest constructs is called Nature Square (also known as the Greek Theater and the Grand Terrace). The railing around the square is in the shape of a serpent and is designed to catch rainwater and direct it to an underground cistern, and the whole thing is supported by 86 columns that make up the Hypostyle Room (or Column Room), which was originally conceived of as some kind of market. The Porter's Lodge, which is the building on the left as you enter Park Güell from the front gates, was designed as a building where the park's caretaker would receive guests and originally featured a phone booth and a large waiting room. It's now small bookshop. The Casa del Guarda (Porter's House), allegedly the most famous—or at least most photographed—building in the park, is a modest dwelling (that's what they say) designed for the family of the park's caretaker to live in. Today it's part of the Barcelona History Museum. You'll see the Park's multicolored tile salamander fountain, called el drac, all over Barcleona on T-shirts and keychains. And he's pretty cool. The fountain is supposedly the overflow outlet for the cistern that is filled from the serpentine edge of the Nature Terrace directly above it. And no, we don't know any of these people in the picture above, but there were so many visitors standing around on the Dragon Stairway that day, it was impossible to get a shot of the salamander by itself. On the east side of the Monumental Zone is a colonnaded footpath done up in Gaudí-style naturalistic tile work that's referred to as the Portico of the Washerwoman (or colloquially as the Laundry Room) because of an incorporated female sculpture of a washerwoman (that we somehow missed). It was designed to look like a wave about to break on shore. 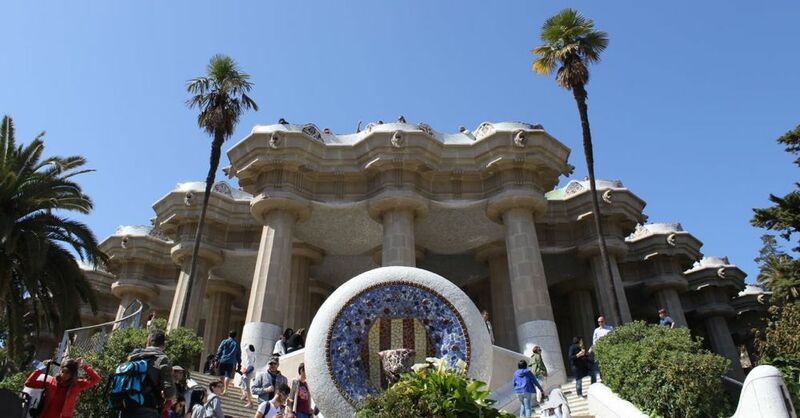 But even if you don't want to shell our your hard-earned euros to get into the Monumental Zone, Gaudí's influence can still be felt throughout the park and, if you don't mind a hike up the steep hill, is worth a trip—especially on a sunny day when you can see the sparking blue Mediterranean sea. Another of Gaudí's works can be found right on La Rambla. Built after he completed Park Güell, it was designed as a private residence for Josep Battló, a wealthy textile magnate who liked the central location where everyone could see his fabulous Gaudí-designed house. Locally it's known as the House of Bones, mainly due (I suspect) to the balconies that look a little bit like human skulls. Or Venetian masks. Or Venetian masks made from human skulls. It has a very colorful exterior facade, but most interesting is the roof, which is peaked to look like a dragon's spine and covered with tiles designed in dragon-skin fashion. The cylindrical tower topped by a cross is said to represent St. George's lance plunging into the dragon's back. (St. George is that patron saint of Barcelona). Detail of the roof of Casa Battló. There were many people waiting in line to get inside, but at €20 per person, we decided it was too expensive to join them. So we admired it from outside. The queue at Casa Battló. 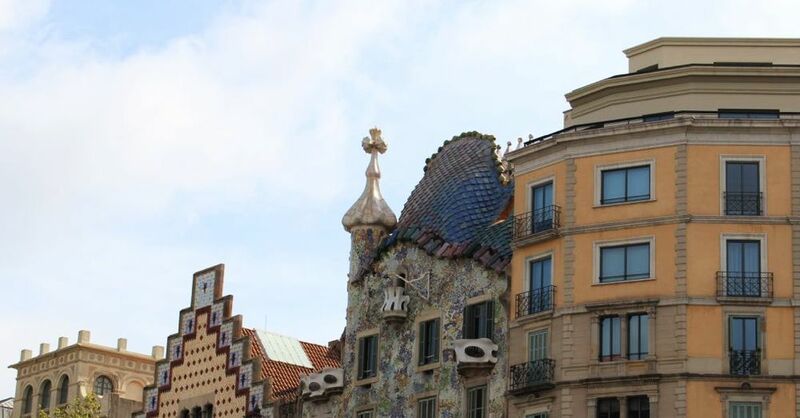 When you go to Barcelona, you will almost certainly run across the name of Antoni Gaudí at least a few times. And we just took in a small sampling of the influence the man had in the world of architecture. If you want see more, check out the full list of Gaudí's buildings, both built and unbuilt, located both in Barcelona and elsewhere.